Due to the terrorist attacks and the uncertainty of the economy, air travel is down. People this holiday season are staying home. That means home-based family activities including videos, games and model railroading are what people are looking for this year. Three days before the attacks, the annual hobby show in Rosemont, Illinois was held. Buyer attendance seemed to be down from previous years. The model railroad industry had been feeling a slow-down since the summer. Companies like MTH and Lionel downsized staff. Since the beginning of the year, talk of recession regularly topped the financial news. In spite of this, many hobby stores are experiencing a boom, particularly in starter set sales. The large TCA show in York, Pennsylvania was heavily attended this past October. Both new customers and seasoned hobbyists are buying trains. Not every industry is doing as well. The airlines are now living the nightmare that the railroad industry realized in the 1960s. It will be interesting to see how they survive. Perhaps there will be railroad-like mergers and we'll see companies such as United American or Delta West emerge. On the left is one of ten cars Lionel sold on eBay for charity. The stars have lights in them. On the right is the boxcar MTH is selling for charity. Ebay created a special "Auction for America" program. The idea is to raise one-hundred million dollars in one-hundred days. Under this program, people would auction off an item and the proceeds would go directly to the charity. This was what the celebrity-signed motorcycle Jay Leno sold was all about. Many train items were sold in the program. We sold a locomotive. 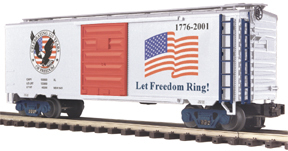 Lionel auctioned ten of their American flag boxcars. They were each signed by Neil Young. The winning bids for them were around $550.00 each. The regular production of the boxcars were sold on their website, and the proceeds were donated to September 11th funds. The cars are sold out. MTH has recently produced a special boxcar as well, with the proceeds going to the NYCPPI fund established by Mayor Giuliani. The cars can be purchased on-line. MTH's recent catalog has a patriotic-themed spread which includes a model of the American Freedom Train, a commemorative train for America's bicentennial. Back in the hobby, trains are being delivered just about every day. Williams Trains new reproductions of Lionel's postwar GE 44-ton switcher have just arrived. Many collectors who grew up in the mid-1950s have a soft spot for these locomotives because they were their first train. The 44-tonner was a lower-priced locomotive and were therefore affordable to families with tight budgets. Williams model is a great puller. It has one motor and "true blast" electronic horn. Williams recently re-deigned and updated their website. 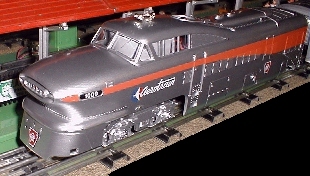 Another new train that is causing some excitement among collectors is the Aerotrain model built by MTH. Like most streamlined trains, this 1956 General Motors features sleek futuristic lines. 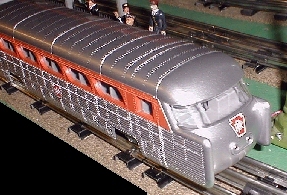 The most interesting visual characteristics are on the locomotive and observation car. DID YOU KNOW that today there are only 102 "wig-wag" crossing signals still on active-duty in the United States? The wig-wag, also known as automatic flagman or banjo signal, was one of the first automatic railroad crossing signals used. They were developed in the 1910s to replace flagmen who would stop cars while a train crossed the street. When a train approached, a banner with a red light in the center would swing from side-to-side to warn cars to stop. Years later, signals with two separate red lanterns were developed to replace wig-wags. The red lanterns flashed back-and-forth to simulate the swinging of a wig-wag banner. These signals proved to be less expensive, and needed less maintenance, and are still used today at highway grade crossings. For more information on wig-wag signals, click here.